Park in the lot on the inland side of Pacific Coast Highway on Winding Way. A bit of history parallels PCH. A remnant of "Old Pacific Highway" runs east-west at the north end of the parking lot. A printed imprint in the cement indicates a date of 17 April 1929. A sign identifies our path to the Falls as "Winding Way Public Hiking and Riding Trail." At the bottom of the sign we see "Private Road." I interpret this oxymoronic statement as "this is the way but keep off the road." At least one person has solved the quandary by scratching out the "Public Hiking and Riding Trail" part of the sign. Arrows indicate on which side of the road we should walk. The shoulder of the road is not my preferred trail but in twenty minutes we spot a trail on the left going downhill to the creek. Cross the stream, turn left and head upstream. Escondido in Spanish could be interpreted as "to hide" or hidden. The waterfall certainly is out of sight. I should say they because three waterfalls in succession come over a cliff. All three are spectacular waterfalls. Accessibility of Upper and Middle Falls is a problem unless one is a rock climber at heart. Today's hike will take us to the foot of the lower falls and I don't encourage further exploration. Route of the trail has been privately owned for many years and traditionally accessible to hikers and equestrians. Several years ago an owner on upper Via Escondido (a road) objected to travel across his property. 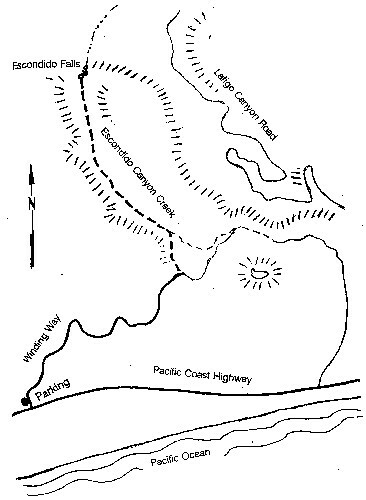 Much discussion until the Santa Monica Mountains Conservancy bought some creek bottom land and built a parking lot at Pacific Coast Highway and Winding Way. Both Via Escondido and Winding Way are posted as private roads so as of now we don't drive on them. Even though we know the best is yet to come we do not hurry. Along the stream we are in the shade of trees. Sycamore, Alder, Walnut and Coast Live Oak grow here. On the immediate sides of the trail we will see a mixed display of flowers well into summer. Look for Canyon Sunflower, White Nightshade, and German Ivy in deep shade. Cliff Aster, Rose, Bush Monkey Flower, Slender Tarweed, Fennel and Bristly Ox-tongue are happier with more sun. Black Sage, Sumac, Toyon, and Bush Mallow are found away from the stream in the chaparral plant community. Two plants to be on the alert for are Poison Oak and Poison Hemlock. Avoid both plants. They grow in partial shade. We cross the stream four times before arriving at the lower waterfall and we do gain some elevation at a moderate rate. Expect a spectacular waterfall because it is. In summer and fall don't look for a lot of water, but after a few good winter rains Escondido is real. Look high and to our left to notice a stone drape. This is calcium carbonate (limestone) and is formed by evaporation of the water, leaving a growing sheet of stone. The upper waterfall supports a great display of these formations and a few caves besides. On our return from the waterfall we will notice trails to the stream. Most of them end but at least one will cross the creek and take us high on the hill to the west and allow a good view of the waterfall and canyon. I prefer to return the way I came.